The Republic of South Africa, most commonly referred to as South Africa, occupies the southern tip of the African continent and borders the nations of Namibia, Botswana, Zimbabwe, Mozambique, Swaziland, and Lesotho. Its long coastline stretches more than 2,500 km (over 1,550 miles) from the desert border with Namibia on the Atlantic coast southwards around the tip of Africa and then north to the border with subtropical Mozambique on the Indian Ocean. It is the most modern nation on the continent, with its protected wildlife and ecosystem, balanced by its modern infrastructure, unmatched in Africa. South Africa experienced a significantly different evolution from other nations on the continent as a result of two factors: higher European immigration rates and the strategic importance of the Cape sea route. Its mineral wealth made the country extremely important to Western interests, particularly during the Cold War. As a result of immigration, South Africa is a racially diverse nation, with black South Africans accounting for slightly less than 80 percent of the population. Racial strife between the white minority and the black majority has played a large part in the country's recent history and politics, culminating in apartheid, which was instituted in 1948 by the National Party, though segregation existed prior to that date. The laws that defined apartheid began to be repealed or abolished by the National Party in 1990 after a long and sometimes violent struggle by the black majority as well as many white, coloured, and Indian South Africans. Its legacy of apartheid etched the country into the conscience of the world, especially in the 1980s, and resulted in economic sanctions from the international community. South Africa is often referred to as "The Rainbow Nation," a term coined by Archbishop Desmond Tutu and later adopted by then-President Nelson Mandela as a metaphor to describe the country's newly developing multicultural diversity in the wake of segregationist apartheid ideology. South Africa contains some of the oldest archaeological sites in Africa. Extensive fossil remains in Makapans Cave and other locations suggest that various australopithecines existed in South Africa from about three million years ago. These were succeeded by various species of Homo, including Homo habilis, Homo erectus and modern man, Homo sapiens, at the Klasies River Caves.Bantu-speaking peoples (here, Bantu is a linguistic term, not an ethnic one), iron-using agriculturists and herdsmen had moved south of the Limpopo River into modern-day South Africa by the fourth or fifth century. They slowly moved south, displacing earlier hunter-gatherer peoples as they migrated. 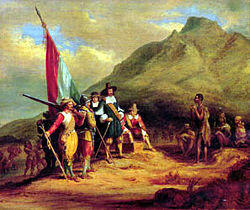 Romanticized painting of an account of the arrival of Jan van Riebeeck. The first circumnavigation of the Cape of Good Hope by Portuguese explorer Bartolomeu Dias occurred in 1488. Along with the accounts of early navigators, the accounts of shipwreck survivors provide the earliest written accounts of Southern Africa. In the two centuries following 1488, a number of small fishing settlements were made along the coast by Portuguese sailors. In 1652 a victualling station was established at the Cape of Good Hope by Jan van Riebeeck on behalf of the Dutch East India Company. For most of the seventeenth and eighteenth centuries, the slowly expanding settlement was a Dutch possession. The Dutch settlers eventually met the southwesterly expanding Xhosa people in the region of the Fish River. A series of wars ensued, mainly caused by conflicting land and livestock interests. Great Britain seized the Cape of Good Hope area in 1797 seeking to use Cape Town in particular as a stop on the route to Australia and India. The Dutch East India Company declared bankruptcy, and the British annexed the Cape Colony in 1805. The British continued the frontier wars against the Xhosa, pushing the eastern frontier eastward through a line of forts established along the Fish River and consolidating it by encouraging British settlement. Due to pressure from abolitionist societies in Britain, the British Parliament first stopped its global slave trade in 1806, then abolished slavery in all its colonies in 1833. 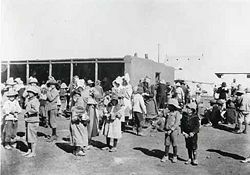 Boer women and children in British concentration camps. The discovery of diamonds in 1867 and gold in 1886 encouraged economic growth and immigration, intensifying the subjugation of the natives. The Boers successfully resisted British encroachments during the First Boer War (1880–1881) using guerrilla warfare tactics, much better suited to local conditions. However, the British returned in greater numbers in the Second Boer War (1899–1902). The Boers resisted fiercely, but the British eventually overwhelmed the Boer forces, using their superior numbers, improved tactics, and external supply chains. Also during this war, the British used controversial concentration camps and scorched earth tactics. The Union of South Africa was created from the Cape and Natal colonies, as well as the republics of Orange Free State and Transvaal, on May 31, 1910. The newly created Union of South Africa was a dominion. In 1948, the right-wing National Party was elected to power and began implementing a series of harsh segregationist laws that would become known collectively as apartheid. While the white minority enjoyed the highest standard of living in all of Africa, often comparable to Western nations, the black majority remained disadvantaged by almost every standard, including income, education, housing, and life expectancy. However, the average income and life expectancy of a black, Indian, or colored South African compared favorably to many other African states. Prison buildings on Robben Island, the holding place of several anti-apartheid fighters including Nelson Mandela, who was imprisoned there for 18 years. Robben Island is now a UNESCO World Heritage Site. Apartheid became increasingly controversial, leading to widespread sanctions and divestment abroad and growing unrest and oppression within South Africa. A long period of harsh suppression by the government, and resistance, strikes, marches, protests, and sabotage, by various anti-apartheid movements, most notably the African National Congress (ANC), followed. In 1990, the National Party government, under acting President F. W. de Klerk and Foreign Minister Roelof ("Pik") Botha took the first steps, making a five-year plan, toward negotiating itself out of power. After consultation with Kenneth Kaunda of Zambia, the National Party lifted the ban on the ANC and other left-wing political organizations and released Nelson Mandela from prison after 27 years of incarceration. Apartheid legislation was gradually removed from the statute books, and the first multi-racial elections were held in 1994. The ANC won by an overwhelming majority and has been in power ever since. Despite the end of apartheid, millions of South Africans, mostly black, continue to live in poverty. This is attributed to the legacy of the apartheid regime and, increasingly, what many see as the failure of the current government to tackle social issues, coupled with the monetary and fiscal discipline of the current government to ensure both redistribution of wealth and economic growth. However, the ANC's social housing policy has produced some improvement in living conditions in many areas by redirecting fiscal spending and improving the efficiency of the tax collection system. 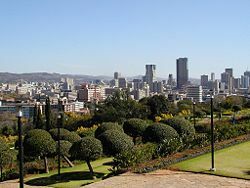 The central area of Pretoria, the administrative capital of South Africa. South Africa has a bicameral parliament: the 90 members of the National Council of Provinces (the upper house); and the four hundred members of the National Assembly (the lower house). Members of the lower house are elected on a population basis by proportional representation: half of the members are elected from national lists and half are elected from provincial lists. Ten members are elected to represent each province in the National Council of Provinces, regardless of the population of the province. Elections for both chambers are held every five years. The government is formed in the lower house, and the leader of the majority party in the National Assembly is the president. Current South African politics are dominated by the African National Congress (ANC), which received 69.7 percent of the vote during the 2004 general election and 66.3 percent of the vote in the 2006 municipal election. The main challenger to the ANC's rule is the Democratic Alliance party, which received 12.4 percent of the vote in the 2004 election and 14.8 percent in the 2006 election. The leader of this party is Tony Leon. The formerly dominant New National Party, which introduced apartheid through its predecessor, the National Party, has suffered increasing humiliation at election polls since 1994, and finally voted to disband. It chose to merge with the ANC on April 9, 2005. Other major political parties represented in Parliament are the Inkatha Freedom Party, which mainly represents Zulu voters, and the Independent Democrats, who took 6.97 percent and 1.7 percent of the vote, respectively, in the 2004 election. 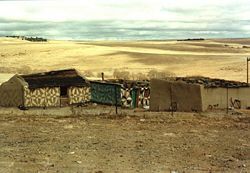 When apartheid ended in 1994, the South African government had to integrate the formerly independent and semi-independent Bantustans into the political structure. To this end, it abolished the four former provinces of South Africa (Cape Province, Natal, Orange Free State, and Transvaal) and replaced them with nine fully integrated provinces. The new provinces are typically much smaller than the former provinces, and theoretically were established in order to give local governments more resources to distribute over smaller areas. The nine provinces are further subdivided into 52 districts, six of which are metropolitan, and 46 district municipalities. The 46 district municipalities are further subdivided into 231 local municipalities. The district municipalities also contain 20 district management areas (mostly game parks) which are directly governed by the district municipalities. The six metropolitan municipalities perform the functions of both district and local municipalities. South Africa's armed forces, known as the South African National Defense Force (SANDF), were created in 1994. In recent years, it has become a major peacekeeping force in Africa and been involved in operations in Lesotho, the Democratic Republic of the Congo, and Burundi, among others. It has also participated as a part of multinational U.N. peacekeeping forces. South Africa undertook a nuclear weapons program in the 1970s and may have conducted a nuclear test over the Atlantic Ocean in 1979. It has since renounced its nuclear program and, after destroying its small nuclear arsenal, signed the Nuclear Non-Proliferation Treaty in 1991. It is the only African country to have successfully developed nuclear weapons and, to date, the only country in the world to have voluntarily dismantled its entire nuclear weapons arsenal. 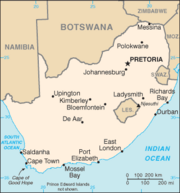 South Africa is located at the southernmost region of Africa, with a long coastline that stretches more than 1,550 mi (2,500 km) and across two oceans, (the Atlantic and the Indian). It borders the countries of Namibia, Botswana, Zimbabwe, Mozambique, and Swaziland. South Africa is the world's 25th-largest country and is nearly twice the size of the U.S. state of Texas. Njesuthi in the Drakensberg at 3,408 m is the highest peak in South Africa. South Africa has a great variety of climate zones, from the extreme desert of the southern Namib in the farthest northwest to the lush subtropical climate in the east along the border with Mozambique and the Indian Ocean. From the east, the land quickly rises over a mountainous escarpment toward the interior plateau known as the Highveld. 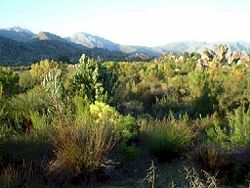 Even though South Africa is classified as semi-arid, there is considerable variation in climate as well as topography. South Africa has one possession, the small sub-Antarctic archipelago of the Prince Edward Islands, consisting of Marion Island and Prince Edward Island (not to be confused with the Canadian province of the same name). Fynbos, a floral kingdom unique to South Africa, is found near Cape Town. South Africa has more than 20,000 different plants, or about 10 percent of all the known species of plants on Earth, making it particularly rich in plant biodiversity. But while it has a great wealth of flowering plants, it has few forests. Only one percent of South Africa is forest, almost exclusively in the humid coastal plain along the Indian Ocean. South Africa has lost extensive acreage of natural habitat in the last four decades, primarily due to overpopulation, sprawling development patterns, and deforestation during the nineteenth century. South Africa is one of the worst affected countries in the world when it comes to invasion by alien species, with many posing a significant threat to the native biodiversity and the already scarce water resources. Pine trees are being removed from all of South Africa, to allow indigenous fynbos and Afromontane forests to be re-established. Numerous mammals are found in the bushveld habitats, which is mainly in the northeast, including Kruger National Park and the Mala Mala Reserve, as well as in the far north in the Waterberg Biosphere. Durban, well-known resort city on the Indian Ocean coast and site of Africa's largest commercial ports. By U.N. classification South Africa is a middle-income country with an abundant supply of resources; well-developed financial, legal, communications, energy, and transport sectors; a stock exchange that ranks among the ten largest in the world; and a modern infrastructure supporting an efficient distribution of goods to major urban centers throughout the region. South Africa's per capita GDP positions the country as one of the 50 wealthiest in the world. In many respects, South Africa is developed; however, this development is primarily centered in four areas, namely Cape Town, Port Elizabeth, Durban, and Pretoria/Johannesburg. Beyond these four economic centers, development is marginal and poverty still reigns despite government strategies. Large income gaps and a dual economy designate South Africa as developing; South Africa has one of the highest rates of income inequality in the world. Growth rates in the last ten years are helping lower unemployment, but daunting economic problems remain. Other problems are crime, corruption, and HIV/AIDS. At the start of 2000, President Thabo Mbeki vowed to promote economic growth and foreign investment by relaxing restrictive labor laws, stepping up the pace of privatization, and cutting unneeded governmental spending. His policies face strong opposition from organized labor. It is estimated that South Africa accounts for up to 30 percent of the gross domestic product of the entire African continent. South Africa is also the continent's largest energy producer and consumer. In 2003, 21.5 percent of the adult South African population was estimated to be HIV positive. The government has recently, after much delay, devoted substantial resources to fighting this pandemic. A study from the African Journal of AIDS Research showed the infection rate starting to level off, from a 4.2 percent to a 1.7 percent infection rate for 15–49 year olds, and AIDS deaths peaking at 487,320 in 2008. Refugees from poorer neighboring countries abound, with immigrants from the Democratic Republic of the Congo, Mozambique, Zimbabwe, Malawi, and many others representing a large portion of the informal sector. With high unemployment levels, many poorer South Africans resent immigrants, who are seen to be depriving them of jobs, a feeling given credibility by the fact that many South African employers have employed migrants from other countries for lower pay than South African citizens, especially in the construction, tourism, agriculture, and domestic service industries. Illegal immigrants are also heavily involved in informal trading. Many immigrants continue to live in poor conditions, and the immigration policy has become increasingly restrictive since 1994. South Africa has a large agricultural sector and is a net exporter of farm products; agricultural exports have constituted 8 percent of South Africa's total exports for the past five years. The agricultural industry contributes around 10 percent of formal employment, relatively low compared to other parts of Africa, as well as providing work for casual laborers and contributing around 2.6 percent of GDP for the nation. Due to the aridity of the land, only 13.5 percent can be used for crop production, and only 3 percent is considered high-potential land. In recent years, the agricultural sector has introduced several reforms, some of which are controversial, such as land reform and the deregulation of the market for agricultural products. 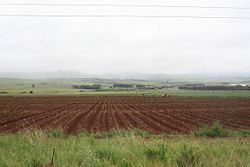 Land reform has been criticized by both farmers' groups and landless workers, the latter alleging that the pace of change has not been fast enough, and the former alleging racist treatment and expressing concerns that a similar situation to Zimbabwe's land reform policy may develop. The sector continues to face problems, with increased foreign competition and crime being two of the major challenges for the industry. The government has been accused of not devoting enough time and money to tackle the problem of farm attacks as opposed to other forms of violent crime. South Africa is a nation of over 47 million people of diverse origins, cultures, languages, and beliefs. In the 2005 census, black Africans were 75.4 percent of the population, whites 14.3 percent, colored 8.8 percent, and Indians or Asians 2.5 percent. Though the major part of the population classified itself as African or black, those people are not culturally or linguistically homogeneous. Major ethnic groups include the Zulu, Xhosa, Basotho (South Sotho), Bapedi (North Sotho), Venda, Tswana, Tsonga, Swazi, and Ndebele, all of which speak Bantu languages. Some, such as the Zulu, Xhosa, Bapedi, and Venda groups, are unique to South Africa. Other groups are distributed across the borders with South Africa's neighbors: The Basotho group is also the major ethnic group in Lesotho. The Tswana ethnic group constitute the majority of the population of Botswana. The Swazi ethnic group is the major ethnic group in Swaziland. The Ndebele ethnic group is also found in Matabeleland in Zimbabwe, where they are known as the Matabele. These Ndebele people are, however, in effect Zulu people because the language they speak is Zulu and they are the descendants of a faction under the warrior Mzilikazi (ca. 1790 - 1868) that escaped persecution from Shaka by migrating to their current territory. The Tsonga ethnic group is also found in southern Mozambique, where they are known as the Shangaan. The white population descends largely from colonial immigrants: Dutch, German, French Huguenot, and British. Culturally and linguistically, they are divided into the Afrikaners, who speak Afrikaans, and English-speaking groups, many of whom originated from British immigrants. Small communities that immigrated over the last century retain the use of other languages. The white population is on the decrease due to a low birthrate and emigration; as a factor in their decision to emigrate, many cite the high crime rate and the government's affirmative action policies. The term "colored" is still largely used for the people of mixed race descended from slaves brought in from East and Central Africa, the indigenous Khoisan who lived in the Cape at the time, indigenous African blacks, whites (mostly the Dutch/Afrikaner and British settlers) as well as an admixture of Javanese, Malay, Indian, Malagasy and other Europeans (such as Portuguese) and Asian blood (such as Burmese). The majority speak Afrikaans. Khoisan is a term used to describe two separate groups, physically similar in that they were light-skinned and small in stature. The Khoikhoi, who were called Hottentots by the Europeans, were pastoralists and were effectively annihilated; the San, called Bushmen by the Europeans, were hunter-gatherers. Within what is known as the Colored community, more recent immigrants will also be found: Coloreds from the former Rhodesia (now Zimbabwe) and Namibia and immigrants of mixed descent from India and Burma who were welcomed to the Cape when the latter countries received their independence. The major part of the Asian population of the country is Indian in origin, many of them descended from indentured workers brought in the nineteenth century to work on the sugar plantations of the eastern coastal area then known as Natal. There is also a significant group of Chinese South Africans (approximately 100,000). As in many sub-Saharan African countries, the spread of AIDS is a serious problem in South Africa. The link between HIV, a virus spread primarily by sexual contact, and AIDS was long denied by the president and the health minister, who insisted that the many deaths in the country were due to malnutrition, and hence poverty, not HIV. Most deaths from AIDS are of people who are economically active, resulting in many families losing their primary wage earners. This results in many orphans who frequently depend on the state for care and financial support. It is estimated that there are 1,100,000 orphans in South Africa. Elderly people, traditionally supported by younger members of the family, are also becoming more and more dependent on the state for financial support. There is great diversity in music from South Africa. Many black musicians who sang in Afrikaans or English during apartheid have since begun to sing in traditional African languages and have developed a unique style called Kwaito. Of note is Brenda Fassie, who launched to fame with her song "Weekend Special," which was sung in English. More famous traditional musicians include Ladysmith Black Mambazo, while the Soweto String Quartet performs classic music with an African flavor. White and colored South African singers are historically influenced by European musical styles, including such Western metal bands such as Seether. Afrikaans music covers multiple genres, such as the contemporary Steve Hofmeyr and the punk rock band Fokofpolisiekar. Crossover artists such as Johnny Clegg and his bands Juluka and Savuka have enjoyed success underground, publicly, and abroad. 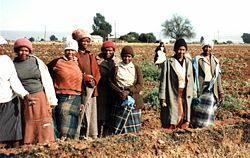 The country's black majority still has a substantial number of rural inhabitants who lead largely impoverished lives. It is among these people, however, that traditional dance and music survive; as blacks have become increasingly urbanized and westernized, aspects of traditional culture are declining. Asians, predominantly of Indian origin, preserve their own cultural heritage, languages, and religious beliefs, being either Christian, Hindu, or Sunni Muslim. South Africa has also had a large influence in the Scouting movement, with many Scouting traditions and ceremonies coming from the experiences of Robert Baden-Powell (the founder of Scouting) during his time in South Africa as a military officer in the 1890s. The South African Scout Association was one of the first youth organizations to open its doors to youth and adults of all races in South Africa. ↑ The Constitution. Constitutional Court of South Africa. Retrieved October 27, 2011. ↑ Principal Agglomerations of the World at www.citypopulation.de. Retrieved October 27, 2011. ↑ The Khoi, Nama and San languages; sign language; German, Greek, Gujarati, Hindi, Portuguese, Tamil, Telegu and Urdu; and Arabic, Hebrew, Sanskrit and "other languages used for religious purposes in South Africa" have a special status. See Chapter 1, Article 6, of the Constitution. Retrieved October 27, 2011. ↑ 4.0 4.1 Mid-year population estimates 2011. Statistics South Africa (2011). Retrieved October 27, 2011. ↑ Census 2001 at a glance. Statistics South Africa. Retrieved October 27, 2011. ↑ 6.0 6.1 6.2 6.3 South Africa. International Monetary Fund. Retrieved October 27, 2011. ↑ Gini Index. World Bank. Retrieved October 27, 2011. 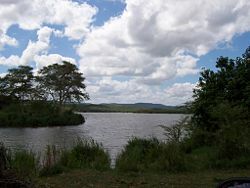 ↑ Sarah Manners, "Africa - The Cradle of Humankind," articlegeek.com. Retrieved June 4, 2008. ↑ Najma Mohamed, "Greening Land and Agrarian Reform: A Case for Sustainable Agriculture." In At the Crossroads: Land and Agrarian Reform in South Africa into the 21st Century, Edited by Ben Cousins. (Bellville, School of Government, University of the Western Cape, 2000, ISBN 1868084671). This page was last modified on 13 October 2015, at 14:59.